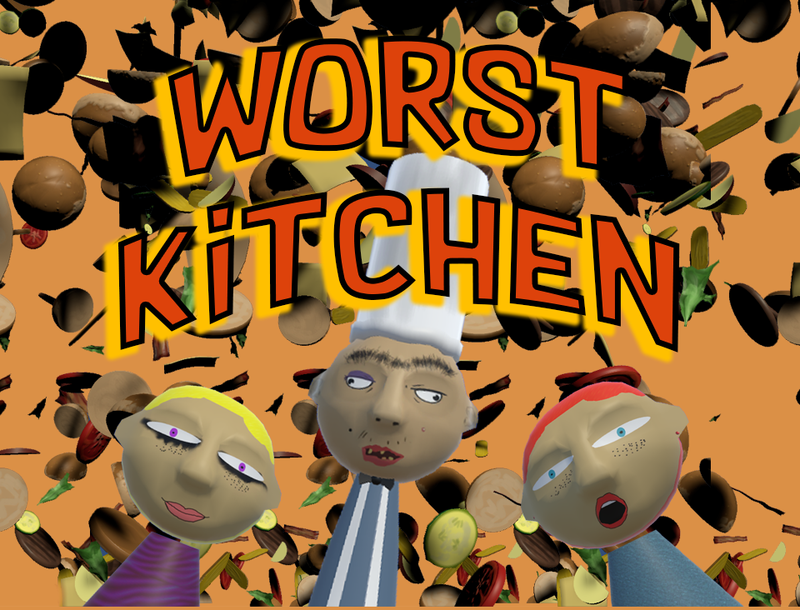 Worst Kitchen is a game about making burgers in a dirty and very unpractical cooking setup. The game works with HTC Vive and Oculus Rift. Can be played in room-scale or stand-up mode. Can be played sitting on a chair. Use the main trigger to grab items, or to make the hand solid and push the table. You have 2 minutes to make the most tips you can. Earn tips when completing orders. Icons on orders indicate what ingredients you have to put in a burger. To prepare an order, put a bottom bread in the plate, then stack the ingredients needed on top, then place a top bread. Serve the plate on the counter and wait for the client to approve or deny the order. Then, another client comes. Items falling on the ground disappear. So, make sure to balance your single leg table.